Do you avoid diary but miss yogurt just like I do? Vegan yogurt is a delicious, affordable option if you and your family love yogurt but are vegan or can’t tolerate dairy products. It’s cultured, creamy, smooth, and tangy – just like real yogurt should be. 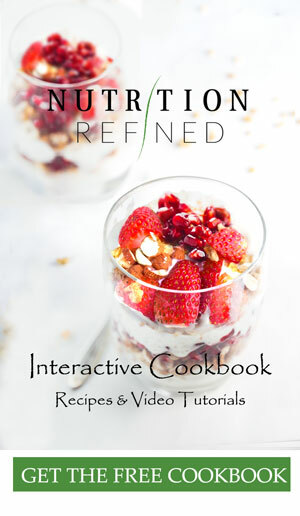 You can serve it plain, or with some fresh fruit or grain-free granola. You can also put it on pancakes, spread it on sweet crepes, or make a beautiful yogurt parfait out of it. As a child, I loved yogurt. No, not necessarily vegan yogurt. Regular full-fat yogurt with sweetened fruit “on the bottom” and sugar everywhere in between. There were also a lot of flavors to choose from – from all kinds of fruit to chocolate. If they didn’t have the flavor I wanted, I would just buy French vanilla and add some real chocolate or fruit to the yogurt. The trouble came when I decided to cut out all sugar out of my diet when I turned 16 (I do eat unrefined sugar now). Cutting out sugar was hard! No more chocolate, no more mom’s homemade apple pie, or even my favorite sweetened yogurt! As hard as it was, I was very determined to stick to my plan. The choices were quite limited so you can imagine how excited I was when I found out there was such a thing as unsweetened yogurt. Well, my excitement faded very quickly when I opened one of the yogurt containers and found out it looked nothing like my favorite fruit-sweetened yogurt. I had no idea how I was gonna eat a whole serving of the tasteless concoction, but I did. Determination is a powerful thing. At first, I hated the taste. But after a few weeks, the taste of plain yogurt actually grew on me and I began to crave it. I guess there really is such a thing as an acquired taste. So when I became a vegan, one of the things I missed dearly was plain yogurt. 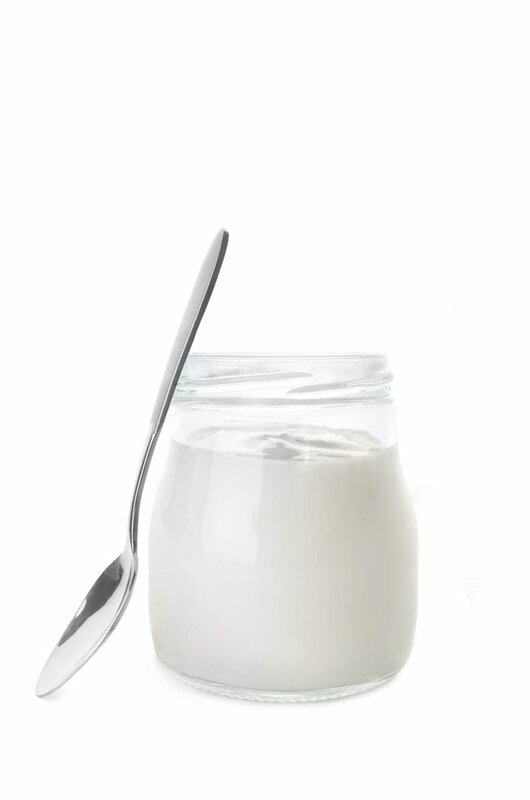 Luckily, I found a great alternative – plain vegan yogurt. The beautiful thing about plant-based yogurt is that there are a lot of options for the yogurt base. I used young coconut, but you can also use canned coconut cream, frozen coconut flesh, soaked cashews, blanched almonds or soaked macadamia nuts. Essentially, any ingredient that you can turn into a thick white cream will work. To be honest, I find that out of all the nuts I just mentioned, cashews work the best. While both blanched almonds and macadamia nuts “work”, they are more fibrous, and don’t yield that same creamy consistency. If you decide to use raw nuts (and by raw, I mean truly raw, not just labeled “raw”), you might want to boil them for a few minutes first to get rid of any harmful bacteria. Regular dairy yogurt relies on bacteria to give it a nice tangy flavor, thicken it up a bit, and provide it with some beneficial probiotics. To get the same result, you’ll need some probiotics (or a plant-based yogurt starter). I use Renew Life 50 billion probiotic capsules that are certified vegan and gluten-free. If you choose a different brand, make sure that it contains a few of the following strains: Lactobacillus acidophilus, Bifidobacterium bifidum, Bifidobacterium lactis and Streptococcus thermophilus. You can also add a few tablespoons of store-bought coconut yogurt with live cultures. Adding a natural sweetener is optional. I add a little bit of maple syrup to provide food for the probiotics. This is beneficial especially if you decide to let the yogurt culture. I say “if” because if you want a really quick yogurt, you can add the probiotics, but skip the fermenting (and add some lemon juice instead). 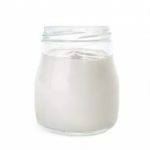 Of course, you’ll get more beneficial bacteria out of fermented yogurt, but this “cheater” yogurt is an option if you’re short on time. The last ingredient is fine sea salt. Salt is important for culturing more than anything. It prevents bad bacteria from growing during the initial stage of fermentation when the oxygen is used up and the newly introduced bacteria begin to reproduce. The correct salt concentration will actually encourage the good bacteria to grow, giving them a competitive edge. Last but not least, the water you use for making cultured foods matters as well. If your water source is a private well than you are in charge of the quality of your water. You should consider having your well water tested every year to check for contamination and the mineral content. If your water comes from a municipal source, you need to be concerned with added chlorine, chloramine, and fluoride, which can inhibit the culturing process. I use spring water for my cultured food and drinks whenever I can. Distilled water is up for debate in my books because it’s completely purified. Not only does it contain no contaminants or additives, but it also contains no minerals. As I have already mentioned in the “ingredients” section, you can either culture the yogurt or skip the culturing. For the cheater version, just blend the base ingredient with filtered water into a thick cream. Start with as little water as possible and add more as you go to get the consistency you’re after. Then add the probiotics – to introduce beneficial bacteria – and some lemon juice for tanginess. Note: the tools vary depending on what base ingredient you use. Vegan yogurt is a delicious, affordable option if you and your family love yogurt but are vegan or can’t tolerate dairy products. It's cultured, creamy, smooth, and tangy - just like real yogurt should be. Open the young coconuts. Drain the coconut water (you can drink the coconut water or add it to smoothies) and scoop out the flesh. Add the coconut flesh into a high speed blender with 1/4 cup (60 ml) water. You will most likely need 1/2 cup (120 ml), but start with less to make sure you get the consistency you like. Once completely smooth, transfer the "yogurt" to a glass bowl. Open the probiotic capsules and empty them into the yogurt. Stir well. For a quick yogurt, add up to 1 Tbsp. (15 ml) lemon juice. Stir and adjust the flavor and consistency - adding lemon juice for more tanginess, a sweetener of choice for some sweetness, and water for thinner yogurt. For a classic cultured yogurt, cover the bowl with a piece of cheesecloth (or an airtight lid for a quicker culturing). Place the bowl in oven with the light on for about 24 hours. The culturing time will depend on many factors, such as the temperature in the oven (mine is 80°F/27°C, the temperature in the house, if you're using an airtight lid, how tangy you like your yogurt, etc). Stir the yogurt after 24 hours and taste. If it's not tangy enough, cover it, and put it back in the oven. You can also add some lemon juice for more tanginess. 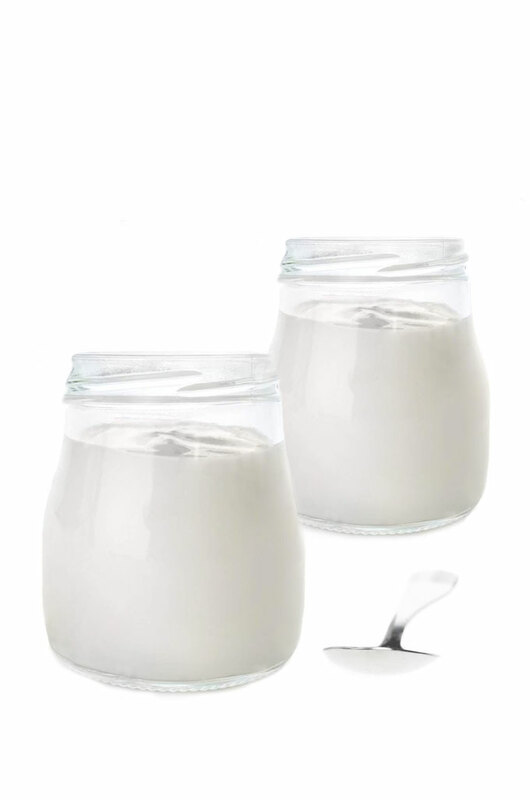 When the yogurt is done culturing, place it in the refrigerator for 6 hours to chill. The yogurt will continue to thicken in the refrigerator. You can always add a splash of water and give it a stir for a thinner consistency. 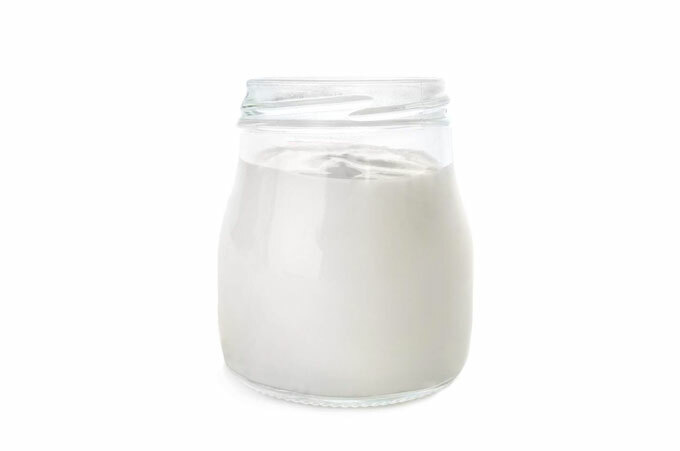 Store leftover yogurt in an airtight container in the refrigerator for up to 5 days. *I got about 2 cups of coconut meat out of the 2 young coconuts. If you can't find young Thai coconuts, you can purchase frozen coconut meat (found in the freezer section of some health food stores). If you go that route, you'll need to let the frozen coconut meat thaw first. *You can also use soaked cashews, blanched almonds, or macadamia nuts instead of the coconut meat. **Prep time does not include culturing (~24 hours). This recipe has been adapted from The Full Helping. Hi Rehab – did you start with 2 young coconuts and 1/4 cup water? You should have very thick yogurt with those measurements. 1/4 (60 ml) water is very little compared to the amount of coconut meat you get from 2 coconuts. Or did you use anything else for the base? Let me know – hopefully we can figure out what went wrong. Hi Geraldine – there are A LOT of brands that sell vegan yogurt starter. I always buy organic and try to make sure that it has several different bacterial strains. Watch out for additives and maltodextrin, which are common ingredients in a lot of yogurt starters. You will need to follow the instructions on the yogurt starter. Every brand is different. Some require a yogurt maker (some don’t), some require a specific culturing temperature (some don’t), etc. Let me know if you have any other questions. Hi Jan – thank you for the suggestion. I will put it on the list! It might not happen within the next few weeks, but hopefully I will get around to it soon. Hi Paola – are you thinking Spnish subtitles for the videos? Could I substitute apple cider vinegar for the lemon juice in this recipe? My daughter has an intolerance to citrus so I have to find alternatives. I love your site, the explanations and simple ingredients are amazing. Hi Angela – thank you so much for the encouraging comment ❤️ Yes, absolutely! Both lemon and apple cider contain acids (the former has citric acid and the latter has acetic acid). Both of these acids are considered weak, so you can substitute one for another no problem. Hi Geraldine – the amount of coconut cream depends on how much yogurt you want. Depending on the thickness of your cream, you might need to thin it out with a little bit of water, ideally distilled. Generally speaking, you will want 2 probiotic capsules for 1 14-ounce can of coconut cream (or even full-fat coconut milk). I use 50 billion probiotic with 12 different probiotic strains. As far as the nuts go, the same will apply. I tend to use 2 capsules for 1 cup of nuts. Hi Petra, me again. Anything to substitute for the probiotic? Can I just use lemon juice? I want to try to make this without buying the pack of probiotic, but if it needs it I will. Can’t wait to try this yogurt! I miss my parfaits, I used to have one everyday with greek yogurt, berries and granola. I’m so happy to have your site at hand, I can’t tell you how its helped me and the family with since we’ve switched over to Vegan. Hi Loria – feel free to ask any time you have a question 🙂 You could skip the probiotics if you’re not making cultured yogurt. You can just use lemon juice to mimic the sour/cultured flavor.